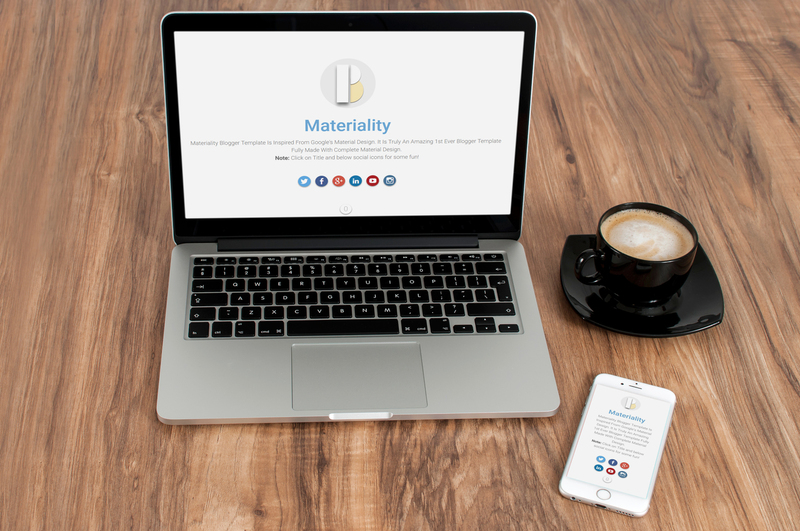 Material Design Blogger Template - "Materiality"
Its been few months I've been working on this one and trust me the theme is epic one! I always loved the stock Android Lollipop - The Material Design, so it was great idea to design one blogger theme inspired from Material Design and I designed one for bloggerhero.com itself, but today I'm going to reveal the "Materiality" theme which is truly amazing theme I've ever designed. You can check the live demo and also I have described some awesome features here about this theme. so let's see what we got something new here? After alot of experiments and some tweaks (and probably after getting some time) I managed to get the work done on design and I guess this will be the very first such kind of blogger template ever, so the Brand New Design! This is a 2 column fully responsive theme with fixed navigation menu bar with header at the top and alot os essential cool widgets. Another thing I loved is "The Ripple Effect" as we have seen on smartphone with material design, the same feature of ripple effect I have added in this theme, you "MUST" click the Blue Title / Social Icons / Tabs and Most important the Post / Article Cardboard and see the MAGIC on your own! Well, you may don't know but most of the theme designers use the Font Awesome Icons in every theme and they are pretty cool but there was no way they could fit in this Material Design Theme, so I implemented the Official Material Design Icons released by Google. Icons look pretty good. As you know the basic Google Card Design with Material Design is pretty good and that's what I took in consideration regarding the Blog Widget or showing the posts in card view, you can see the shadow when you hover on them. This one is my favorite, you should checkout the search widget at the top right corner, just click on it and see the magic again! One of my social sharing widgets, I made the similar functionality but withe some material design effect. Again one of the best features in this theme are the custom pages, I have designed the 404 Error "Page Not Found" / Blog Thumbnail Page and Sitemap Page with different designs, do check the links on the navigation bar. Note : There will be weekly or may be monthly updates for this and I'll literally try to release as many as color variants as well as the layout variants for this theme. Please comment your reviews, suggestions, thoughts here in comments below, that'll help me alot. At last, sharing is caring right? :p .Do reply. There is no download link there. Please tell me how can i get this template. How can i download it. Your designs are very unique. Is it free or would i have to buy it? I really like the design of this template. I'm from Indonesia, giving a 5 star rating for this template. What are you waiting for? Come on, click the 'Purchase' button! This template designer is also very kind and generous.